BALLONS du LEMAN is a Swiss operating company who is specialized in hot air balloon flights for private individuals or large corporate groups. We launch from the nicest spots around Lake Geneva so that we can share our passion with care and friendship with all our passengers. Based in the French-speaking part of Switzerland, BALLONS du LEMAN is a Swiss company recognized by the Federal Office of Civil Aviation for the public transport of passengers and the commercial exploitation of hot-air balloons. Experience and pro-activity, friendly spirit and sense of responsibility… the spirit of our teams contributes to offer a personalised service to our customers. Our flying goal: that everyone can live an exceptional moment that will remain etched in his memory. 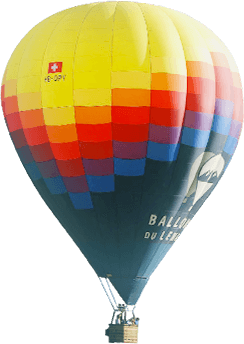 BALLONS du LEMAN is born of a common passion and a great friendship between Fabien and Gaël. It was in 2011 that their company was born. After having flown for several balloon companies and travelled the world aboard their basket, they wanted to share their experience and their love of the air. Fabien discovered ballooning during his engineering studies in 1999. He got addicted very quickly. He participated in many competitions, and in 2006, he won the 3rd place at the Swiss balloon championships. He then joined the Swiss national hot-air balloon team. He accumulates hundreds of hours of mountain flying experience and today flies exclusively for BALLONS du LEMAN. Gaël attended his first hot-air balloon flight at the age of 4 years. The passion for ballooning never left him after that! At the age of 17 years, he passed his license and in 1994, he became a professional pilot. He co-founded in 2011, BALLONS du LEMAN with Fabien. Gaël’s experience totals more than 1,600 hours of balloon flight and 14,000 hours of aircraft flight. Manel has a long aerostatic experience and totals several thousand hours of flight. He is a professional pilot for many years and also an expert inspector for the world’s leading manufacturer Ultramagic. He joined BALLONS du LEMAN in 2014 as chief pilot. 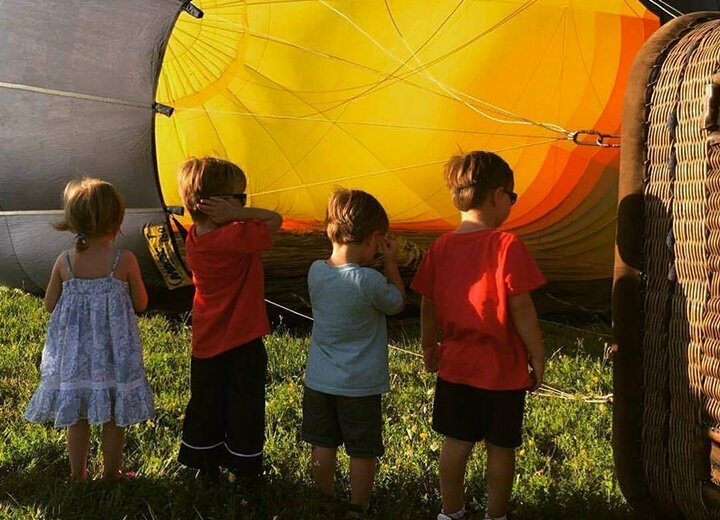 Manel has 2 children who share the same passion for ballooning. Used to long-distance flights, Max is an adventurer of the air. 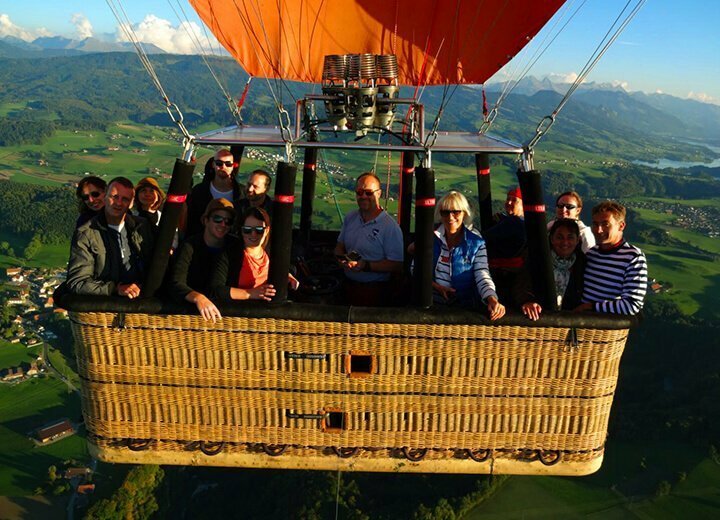 After working as a manager in several ballooning companies, he arrived in Switzerland in 2014 to settle in Château-d’Oex, where he had learned to make his first mountain flights 25 years ago. Max enjoys mountain biking during his free time. After several seasons in the tourist industry in Geneva and Verbier, Jackie came to join our team for the admin and commercial part. Jackie likes paragliding and hiking in the Alps. Jackie will do her best to satisfy you! Coming from the world of design and graphics, Thomas is our head of ground-team and flight logistics since 2017. Thorough and conscientious, Thomas will do everything to make sure that your flight takes place in the best possible conditions. Thomas is passionate about photography and traveling. A great ground team made up mainly of students from EPFL or EHL but also young employees who put all their strengths so that you can live a friendly and memorable experience with us. The team counts around 40 members to provide the best service and totally satisfy you. Our 5 fundamental pillars are our guidelines and represent our core values. Our professional and passionate crew makes all the difference! This is our priority. We prefer to cancel a flight if we believe that all security conditions are not met. It’s our reason to fly and exist. It drives us and pushes us to excel on all our flights so that you can enjoy every moment with us. You cannot make that up! Each flight is different and each passenger unique. The experience of a hot-air balloon flight is rare, and we want you to have an unforgettable memory of it. We pay attention to every detail, from our first contact. An essential quality. Our crew members make sure that you get the most out of this experience. Don’t hesitate to tell us about your special desires or wishes, we will personalise your flight. Today, it seems essential to us to integrate into an environmentally friendly program, as our activity uses a fossil energy (gas). That is why BALLONS du LEMAN annually compensates all its gas consumption with an independent ecological organisation. The amounts paid are invested in sustainable environmental projects. Our method of calculation: An estimation of the amount of CO2 emissions produced during our flights is made by a specialised company “CO2 Logique”. On this basis, we make donations to several different projects such as green energy research that aims to reduce the consumption of polluting energies. All our balloons are relatively new and technically advanced. Our equipment is continuously checked by an independent accredited company. BALLONS du LEMAN is approved by the Federal Office of Civil Aviation for the transport of passengers. Our flying region has been elected one of the 10 most beautiful ballooning regions in the world by the holidaymaker’s company (TripAdvisor). BALLONS du LEMAN received the first prize of the operators by this same company. We take off from everywhere in the French-Speaking part of Switzerland to offer a wide range of landscape to our customers. We can take off wherever you want for your events. We choose the most beautiful sites to amaze you! You can compare, our services certainly offer the best quality/quantity/price ratio. Our customers, individuals and professionals, are our best advertising medium: their opinions are very positive (see reviews). Each year, BALLONS du LEMAN invests in a humanitarian project. Aware of the chance we have to live from our passion, we wanted to share it with the greatest number. We thank the foundation MAKE a WISH, who trusted us and gave us the chance to realize this project. In 2017, we supported the MIRACLES Foundation, which works on improving the life of landmine victims. Thanks to them for everything they do!